How can aquaculture confront the challenge of climate change? In developing countries across the world, various forms of aquaculture are increasingly viewed as tools for sustainable development and food security. No better country can help shed light on this trend than Bangladesh. Resting atop the Bay of Bengal and to the east of India, Bangladesh is a country of nearly 160 million people. Feeding Bangladesh’s large and rapidly growing population is a pressing challenge. To understand how aquaculture fits into Bangladesh’s food security picture, it’s important to understand what is causing food insecurity. For decades, rice has dominated the Bangladeshi diet, accounting for 70 percent of caloric intake. Nearly 80 percent of agriculture land is dedicated to rice farming. So why can Bangladesh no longer rely on this staple crop to feed it’s people? Part of the answer, is climate change. Bangladesh’s geography has made it one of the first countries in the world to feel the effects of climate change. Rising sea levels in the Bay of Bengal are flooding rice farms from the south. From the north, melting glaciers in the Himalayas are causing higher river flows – and more flooding. At the same time, increasingly severe and unpredictable droughts – the result of changing weather patterns – have also reduced rice production. To feed its people amid a perfect storm of climate challenges, Bangladesh has turned to aquaculture. As I witnessed on a trip to the country in 2011, fish farms raising tilapia and shrimp are springing up in fields previously used for rice farming. The benefit of fish farming is resilience. Floodwaters can wash over fish pens with little or no damage, and land that is no longer viable for agriculture can easily be turned into fish farms. 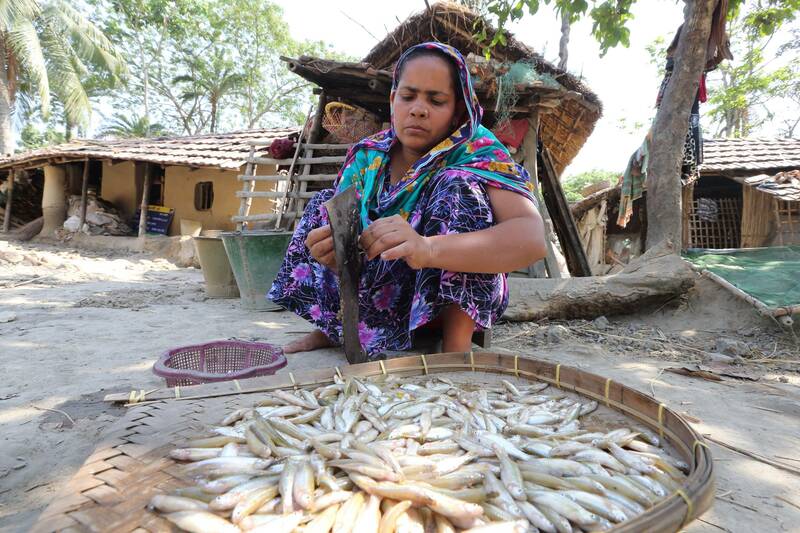 The increase in aquaculture in Bangladesh has been dramatic. Estimates show that around 1.4 millions tons of fish are produced each year, a 27 percent increase over 2011 statistics. To be certain, new industries do not emerge without risk. Serious questions have surfaced about the environmental integrity of shrimp farming in Bangladesh, concerns that should not be taken lightly. But in a country that is facing an uphill battle to confront the compounding impacts of population growth and climate change, aquaculture has become a symbol of hope and innovation in Bangladesh. Jacob Glass researched aquaculture and sustainable development for the Woodrow Wilson International Center for Scholars’ Environmental Change and Security Program. Jacob subsequently served as an environmental policy analyst in the Office of the U.S. Secretary of Transportation. Jacob is currently a Harry S. Truman Scholar at Harvard University. Two of the ICOF Tilipia Cages in Lake Azuei are designated for the school in the village of Medan Belize. The Tilapia are a source of delicious protein for the school children and the revenues from the sale of the fish help to pay teachers salaries and for school supplies. Michelle Wong, an EcoGastronomy Major at UNH and a longtime friend of Island Creek is on assignment for us in Zanzibar. She will be blogging about her time in Stonetown, the women she is meeting and her impressions of this far-away place. Michelle’s mission is to visit chefs at local restaurants and resorts to promote the use of the shellfish that will someday be generated by the village hatcheries ICOF and Woods Hole Oceanographic Institution are developing. The woman reaches down and plucks the octopus from the reef, its writhing appendages curling and twisting around her wrist like a string of prayer beads, fighting back. In one swift motion, she takes the long metal spike in her other hand and drives it into the underbelly of the octopus and through the top of its head. A thick stream of ink flows from the animal clenched in her fist, staining the shallow water around our feet an unsettling black. “Chakula kitamu” I joke, “Good food”. The now-still octopus is plopped into an old rice bag along with the assortment of other sea creatures that the woman has collected that morning – small fish, spurting sea cucumbers, snails in intricate shells, cockles, crabs and oysters. By the time the tide rolls in, she expects to have about 10,000 Tanzanian Shillings (TSH) or $6.25 USD worth of product to sell to the locals and middlemen who travel to the fishing village, Fumba every day to buy fresh seafood at a good price. We part ways and I continue towards the dugout canoe anchored at the edge of the reef, tiptoeing around hundreds of devious sea urchins nestled in the coral like landmines. Today, my guide and I are the guests of a local fisherman and pearl farmer who will show us his pearling operations. To get to the fisherman’s boat we must walk across about a quarter of a mile of young coral reef, which crunches under our feet like broken glass. My stomach turns guiltily. The pearling and jewelry project is funded by a few groups in the United buy valtrex online States including the University of Rhode Island. Large oysters are collected and implanted with three plastic “buttons”. The imbued oysters are then placed in mesh cages that hang from floating lines attached to moorings. Every few days the oysters are scrubbed down and cleaned, and nine months later, shimmering semi-spherical pearls are ready to be made into necklaces and earrings by the village women who can get about 30,000 TSH ($18.75 USD) for each piece – the equivalent of what many island families make in two weeks. Seashells collected from surrounding villages are also incorporated into the jewelry pieces. The thought I can’t shake however, is how focused the Fumba villagers – the intended beneficiaries of the hatchery seed, are on jewelry making versus farming. In some ways our project is in direct compeition with the jewelry/pearl project for the villagers’ attention, time, and interest. Jewelry making and pearling are smart, supplementary industries but they don’t do anything to solve the crux of the problem and the reason why people turned to jewelry in the first place; depletion of wild shellfish stocks. I think back to the woman I met on the reef. Although she might make some decent money for her harvest, she wasn’t able to find even one kilo of each species, only finding a handful of each. This method of harvesting also involves walking over and ultimately damaging coral reef which is an incredibly delicate and important part of the ecosystem. While jewelry does provide the villagers with money, it doesn’t directly feed them like aquaculture. Maybe a happy partnership can be forged between these two related projects with a majority of the hatchery seed being used for consumption and the remaining fraction being used for pearls. Shellfish farming – heck, all farming in general – requires tremendous patience. And for people who live off of less than $5 a day, who are hungry today, patience must seem like a lot to ask. But with a little patience, foresight, and creativity, big problems can be solved with some pretty exciting, big solutions. It seems like no matter where you travel to on this island that people are in constant contact with the sea. On the two hour drive to Nungwi, Zanzibar’s northernmost point studded with luxury resorts, you can see women gathering shellfish along the beach for miles. To make the trip north I hopped in the back of a dala-dala. Precarious vehicles that can only be described as a long pickup truck with a roof, dala-dalas are the most popular and authentic method of transportation on the island. Open sides let hawkers wave fistfuls of grilled corn and fresh sugar cane in passenger’s faces, wobbling roofs held up by intricately carved wooden trellises support burlap sacks filled with coconuts, and babies are handed off to nap in strangers’ laps when there isn’t enough room to sit. My purpose in Nungwi wasn’t to dissolve into the golden halo of white sand or join the busloads of European tourists in a photographic frenzy (although maybe a little of both did happen), but to gain an audience with chefs at the resorts that occupy the town. So off I went each morning; hat on my head, pen in my hand in search of bivalve-curious customers. At Island Creek Oysters, it is often said that we don’t have to work hard to sell our product; the oysters are so good, they can sell themselves. Therefore it’s ultimately about the relationships that you build with the people who feed them to the world. And in Nungwi, I am pleased to report every executive chef, food & beverage manager, and general manager that I spoke with wanted in. Much like home, it wasn’t hard to find people who were as eager to participate as they were hungry for good shellfish. After a long first day it was time to succumb to the lullaby of waves crashing and blowing kisses to the setting sun. I was sitting down at a local bar when I met a young fisherman from South Africa. We were sharing the sunset, a few cold beers, and stories from home when he told me about the ferry accident. In 2012, a ferry over-loaded with refrigerators, cars, and more than 2,000 passengers capsized on rough waters off of Nungwi. The fisherman, only a few months older than myself told me how the beach turned black with bodies and of the lives that slipped out of his hands because the water was too slick with oil. He told me how the sea was so brimming with corpses that he feared to turn on his boat’s engine. And he told me how he and the local fishermen were called out at midnight to search for survivors because Tanzanian navy personnel didn’t know how to swim. His story left me speechless. I instantly thought of the women in villages just minutes from where the ferry sank, most whom are unable to swim. This inability is an incredible handicap that makes it impossible for them to join men in fishing boats. Perhaps if the women were taught to swim with the addition of improved equipment, like the dredges that we use at ICO to harvest at high tide, they might be able to access the abundance of shellfish in deeper waters? And if this was so, then perhaps there wouldn’t be such a great need for a shellfish farm? But of course, we are here for a reason. Life has its odd ways of showing you, even in the most beautiful of places, the value of something as simple and inherent as teaching a woman to swim; much like teaching a man to fish. It’s the kind of heat that you feel instantly; a heavy and humid heat that turns your sweat to candlewax and soaks through your clothes. It’s the kind of air so thick you have to fight your way through it; pushing particles aside as you walk, swimming in a jar of warm honey. The sun is high and burns off the remaining clouds that welcomed our ferry into Zanzibar’s port with a sprinkling of rain. The harbor’s mouth is dappled with a collection of forever-fluctuating sandbars that gleam like golden brushstrokes in the water, and ancient dhows trail our wake with their tea-stained triangular sails. Stone Town, a world heritage site and my new home for the next month is visible from the water as we approach. For the next four weeks, I will be involved with a project three years in the making. A collaborative effort between the University of Dar Es Salam (IMS), the Woods Hole Oceanographic Institute (WHOI), and Island Creek Oysters Foundation (ICOF), aims to introduce shellfish hatchery and cultivation techniques to villages in Zanzibar, a small island off the coast of Tanzania that is about six-times the size of Nantucket. Seafood is the primary source of protein on the island and can be found on practically every menu you come across. While the men traditionally catch fish, it is the women who harvest shellfish. In coastal villages along east Africa including those on Zanzibar, it is common to see women on the flats at low tide in search of wild clams, oysters, and cockles; their silhouettes bent over double, digging into the mud, still draped in their brightly-colored robes and scarves. The harvested shellfish is boiled, dried, and taken to local fish markets to be sold. In villages scattered along Menai Bay where the IMS-WHOI-ICOF team has been focusing most of their efforts, wild shellfish stocks are becoming increasingly harder to access. The women in some villages, who already are walking a mile to reach the product, are forced to walk even further, sometimes up to their necks in water. For the past three years, the project has focused on establishing a shellfish hatchery that will eventually provide a controllable and steady supply of “seed” (baby shellfish) to be raised by the women in Menai Bay. Long term goals of the project will be to establish a strong customer base and to train locals how to cultivate, process, and sell the shellfish. The hope of the project is for the villagers to be able to produce an economically and environmentally sustainable source of protein and income. In a region where the average person lives off less than five dollars a day, the project’s success would have an incredible influence on the lives of these hardworking women and their families. My task however, is to begin a dialogue with restaurants, study the local market’s demand for shellfish, and to establish a venue for growers to sell their products. Things are looking up already – just this morning we had a successful spawn in the hatchery, and are proud new parents of some microscopic blood cockles. It’s achievements like this that gives everyone confidence in the project that lies ahead – which still, isn’t a hard thing to believe in. Because after all, we do believe in aquaculture. Photographer Julia Cumes recently visited the ICOF Hatchery Project in Zanzibar and shared with us her images and reflections on her time with Ikawa, one of the women farmers. Currently, the women have to walk miles to harvest wild shellfish. A successful shellfish farm will be more accessible to Ikiwa and the other women farmers, and will provide a more dependable source of protein and income for the farmers and their families. The remarkable photograph of Ikiwa walking across the flats will be one of the featured items in the Friends for Haiti Silent Auction on September 8, 2012. I spent time with Ikiwa while working on a story about an aquaculture project that hopes to teach rural women in Zanzibar how to cultivate shellfish as an alternative form of protein. After documenting the scientific aspect of the project in the shellfish hatchery, spending time in Ikiwa’s world really personalized the project for me and made me see the potential impact the project’s success could have on her life. Ikiwa Abdulla walks out almost a mile onto the shellfish flats to gather shellfish in Fumba, Zanzibar. The temperature is scorching and Ikiwa, along with other women from her village, spend most of the day bent over double, digging into the sand to find clams, cockles, oysters and conchs. As Zanzibar’s shellfish stocks become more and more depleted, women like Ikiwa have to walk out further and further into the ocean at low tide to reach the wild shellfish that remain. Over the last two winters, I spent some time in Zanzibar working on a story about an aquaculture project that hopes to help women like Ikiwa. A collaborative effort by the Woods Hole Oceanographic Institution and the Island Creek Oysters Foundation, both based in Massachusetts, the project hopes to teach rural women in Zanzibar how to cultivate shellfish and help replenish shellfish stocks in a part of the world where protein is in shorter and shorter supply and economic opportunities for rural women are few and far between. While I spent quite a bit of time documenting the scientific aspect of the project in the shellfish hatchery where experiments are being done to find the best way to cultivate a healthy, consistent local species of shellfish seed, the most extraordinary part of my experience was the time I spent with Ikiwa. Except for her cell phone, Ikiwa’s world appeared to me much as I imagined it must have been for the people of Zanzibar hundreds of years before. The home she shares with her extended family is made of stones, sticks and straw. She cooks over open fire and the house has neither electricity nor running water. After spending a day on the shelffish flats with Ikiwa and the other women, I noticed how labor-intensive their work was and how little food they returned home with. There is a long tradition of harvesting shellfish in the wild in the coastal villages of east Africa. Typically the women who harvest them bring them back and boil them to extract meat from the shells. Without access to refrigeration, this renders the shellfish meat in a form that is relatively easy to keep for a few days without spoiling. While the women use some of the shellfish to feed their families, they sell most of it at the daily food market. Witnessing Ikiwa’s struggle to bring home enough shellfish to feed her family and also make a small profit, the aquaculture project’s potential impact on her life really struck me. We express our sincere gratitude to the Island Creek Oyster Foundation (ICOF) and all the people who have contributed to make the Friends of Haiti Event a great success. Our mission is to improve nutrition for millions of Haitians and generate income for thousands while using environmentally friendly technology to produce high quality fish. Through our programs, we pledge to oppose poverty, increase opportunities for better education and improve health conditions among the poorest. Overall, your donation has touched the life of 240 families and increased production by forty-thousand (40,000) pounds of fish between November cialis 2011 and February 2012. Haiti has indeed taught me lessons. I have been fortunate to share some of those lessons and my story with Skip Bennett and Shore Gregory who visited Haiti last year. Their love and desire to help the Haitian people were overwhelming. I look forward to future collaboration with Skip, Shore and the entire ICOF family. Again, we thank the Island Creek Oyster Foundation for the trust and support given through the venue of Friends of Haiti. I wish you continued success with your charitable work.